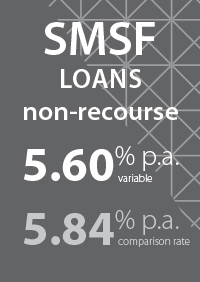 What does it mean for the future of SMSF lending? 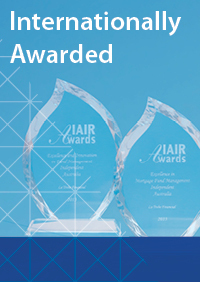 The recent FSI report referred to as the “Murray Inquiry” (after inquiry Chairman - Mr David Murray AO) was released on 7 December 2014 and is the first broad financial system inquiry since the Wallis Inquiry 16 years ago - which resulted in the creation of the Australian Prudential Regulation Authority (APRA), and led to changes affecting the Australian Securities and Investment Commission (ASIC). The Treasurer of the Commonwealth of Australia, The Hon Joe Hockey MP announced the final terms of reference for the Government’s FSI on 20 December 2013 with the objective to examine “how the financial system could be positioned to best meet Australia’s evolving needs and support Australia’s economic growth”, calling for recommendations that “foster an efficient, competitive and flexible financial system” over the next decade. In response to the announced terms of reference, the FSI received over 280 submissions from consumers, SMEs, financial institutions, regulators and government, which helped shape an interim report that was released on 15 July 2014. The interim report received a staggering 6,500 submissions in response. The final Murray report, issued on 7 December 2014 appears to have two key themes: the funding of Australia’s economy; and, boosting competition. Included within the report are 44 recommendations designed to serve as a blueprint for the financial system for the next ten years. The government is now inviting key stakeholders, as well as the general public to provide written submissions in direct response to the recommendations made which may be lodged up to 31 March 2015 - so there is time to pass before any changes are made. The 44 recommendations are wide-ranging; today, we are going to focus on one of the key recommendations that has direct impact on the mortgage industry – Direct borrowing by superannuation funds – read, SMSF loans. The FSI has recommended that superannuation funds are again prohibited from borrowing directly using a limited recourse borrowing arrangement (LRBA). 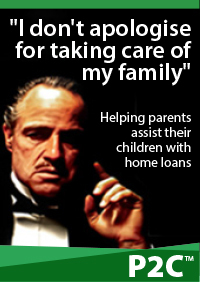 This can be done by removing Section 67Aof the Superannuation Industry (Supervision) Act 1993 (SIS Act). The objectives given by the panel in the FSI are to “prevent the unnecessary build-up of risk in the superannuation system and financial system more broadly”, and to “fulfil the objective for superannuation to be a savings vehicle for retirement income, rather than a broader wealth management vehicle”. The panel’s concern, in part, relates to the rapid upward trend of superannuation funds using LRBAs to purchase assets – an 18-fold increase in LRBA borrowings over the past 5 years, increasing from $497 million in June 2009 to $8.7 billion in June 2014. There are now more than half a million self-managed super funds (SMSFs) in operation according to recent statistics from APRA, and it is estimated that the SMSF funds will have grown to $2.23 trillion by 2033. The panel argues that investors have other ways of leveraging to purchase investment assets outside superannuation, as opposed to putting their retirement savings at risk – a savings vehicle not a wealth creation tool. Diversification of assets was raised as a problem requiring addressing, the panel concluding that superannuation funds use diversification to reduce risk, whereas smaller funds that borrow are more likely to have a concentrated asset mix. 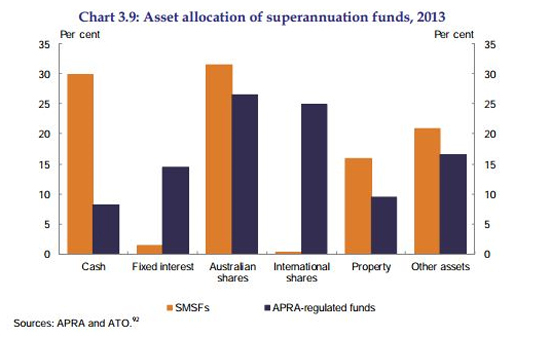 Looking at the chart below (based on data supplied by APRA and the ATO, it appears as though SMSFs have sufficient levels of diversification, other than holding substantially more cash, and being underweight in International Shares and Fixed Interest investments, when compared to APRA regulated funds. 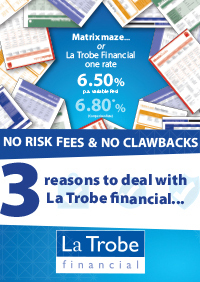 Lenders charging higher rates due to the limited recourse nature of the loans was also raised as a problem, however at La Trobe Financial, SMSF loans attract the same interest rate as the standard variable rates on offer, in fact, in some cases less. Finally, the panel noted obtaining trustees’ personal guarantees as a concern because of the higher risk that trustees are likely to sell other assets of the fund to repay a lender to protect their personal credit file. 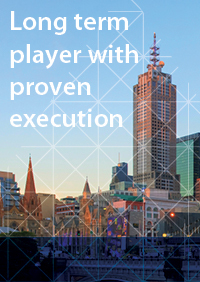 We believe obtaining personal guarantees is an entirely reasonable request that should not frighten or deter trustees, rather encourage them to perform a detailed due diligence on the investment transaction prior to committing, as their personal credit history is on the line; and with weighted average LVRs often less than 70% the likelihood of significant capital loss is low. 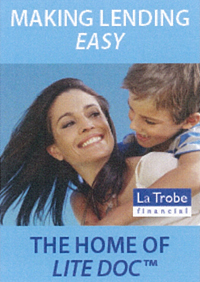 We would be surprised if the government adopts the recommendation to prohibit direct borrowing by superannuation funds, and believe that banning LRBAs goes against the fundamental principles of being able to “self manage” your superannuation fund – it is your retirement nest-egg, therefore you should be able to choose how you manage it (without exorbitant management fees), and property is an asset class that most Australians are comfortable with – they understand it, which is a much safer outcome than allowing punters to invest in asset classes they aren’t as au fait with. If the government chooses to adopt “Recommendation 8” SMEs are likely to be the hardest hit. Borrowing through a SMSF has allowed thousands of business owners to purchase the property from which they operate their business, taking advantage of the beneficial tax structure a SMSF offers. There is still time before a course of action is likely to be taken by government, however we expect the media hype around this issue is likely to spur a mini-boom of sorts in SMSF property investment between now and March 2015, as business owners and investors look to take the chance to leap through what may be a closing window of opportunity. If you have clients contacting you seeking finance for their SMSF investment, please call your Senior Manager Client Partnerships directly, or one of our Senior Credit Analysts on 13 80 10 to discuss your scenario. 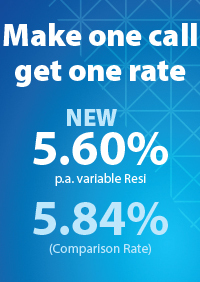 We have loans to cater for SMSF borrowing for both residential and commercial property.